• Do you know enough words to express yourself adequately and precisely? • We make sure that learning new words is enjoyable and rewarding. • We also advise you on special learner-training techniques for acquiring and remembering new words. • Do you think German grammar is complicated? • We show you how to master tricky points like der - die -das, dative - accusative or Ich will kaufen - Ich werde kaufen. We do help you speak and write easily and accurately. 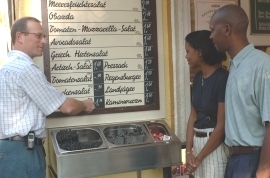 • Do you struggle with names and words like München or zwölf Knödel? We teach you how to pronounce the particular German letters and articulate difficult German names and words. • We ensure you gain clarity and fluency in conversations, discussions and presentations. • Can you always understand your friends' and colleagues' German? The German on radio and television, in books or newspapers? • We analyse why understanding - spoken or written language - is difficult for you. • We practise appropriate individual techniques for a quicker, easier and truer understanding. • Do you wonder about Du or Sie, dress code or values like sense of order or humour? • We help you understand aspects of life in Germany and how to avoid a 'culture shock' through intercultural awareness and understanding training. • Our aim is to prepare you for life and work culture in Germany, Bavaria and Munich.